For all the grief Android fanboys give Apple for merely refreshing its iPhone each year they don’t always hold Android smartphones to the same accountability. Sure, most years we something big and revolutionary happen across the board; most hardware makers are able to produce something that looks different at first glance from one model to the next. What happens, though, when someone appears to go back to the same well three times in a row? 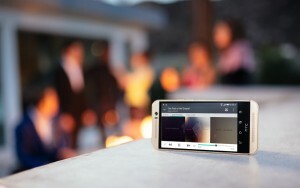 In a boiled-down look, that’s what HTC has done with its flagship One. The argument of revolution versus evolution plays out quite heavily with the HTC One line of devices. At a casual glance the average person might not be able to quickly identify the difference between the now-three generations? More importantly, does that matter? Suffice it to say, the One and the One M8 received high marks for build quality and look to represent HTC very well. While other hardware makers were going the cheaper route with materials, HTC was putting out solid devices. 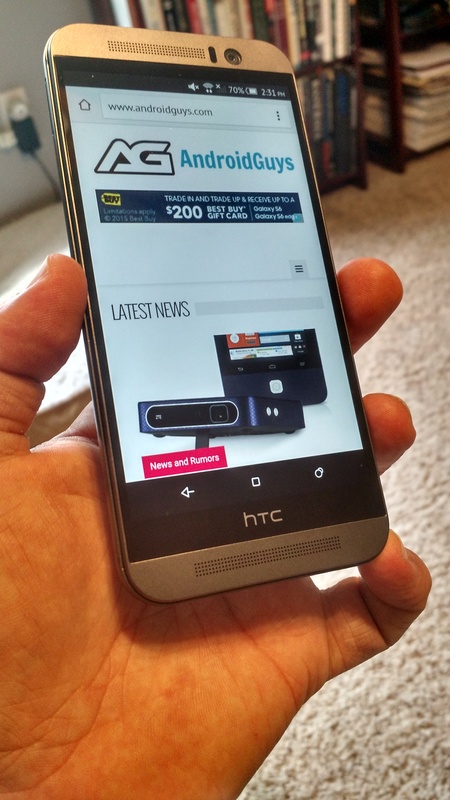 The HTC One M9 is not all that different from its predecessors yet it feels new at the same time. 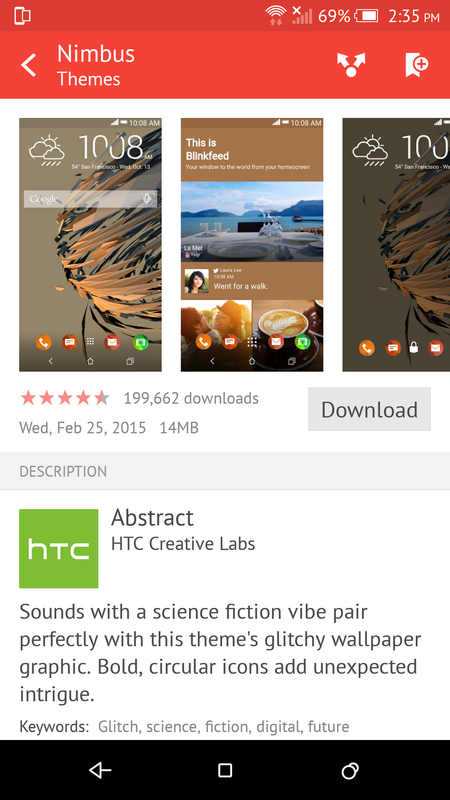 Attributed to Android 5.0 Lollipop and HTC Sense 7, the UI is the first thing that sticks with you. Remember back to the first generations of HTC Sense and how it was a welcome alternative to the stock Android experience. A few years later, however, we were pining for HTC to stop pushing its agenda so heavily and to scale things back. The 7.0 release of Sense feels terrific and relies more on what Android sets forward with its Material Design principles. Not only does Sense look wonderful with its more minimal influence, it’s also smarter than ever before. Out of the box you’ll find the One M9 set up with widgets, BlinkFeed (left screen), and a customizable launcher. What’s more, you’ll have a widget called Sense Home which is designed to highlight apps and games you’ll be more prone to use at home. The idea is that when you leave you’ll turn to different apps; work sometimes requires entirely different apps. It might take a while for the phone to totally learn your preferences but it’s rather cool when it does. For those who already have specifics in mind you can drag and drop your own titles into the widget and jumpstart the learning. For me BlinkFeed has always been a mixed bag. I love the concept but I always felt like execution was not where it could have been. That’s somewhat the case here for the latest iteration. Yes, there are more tie-ins and features, yet somehow I still come away wanting to drill down even more. If there were a way for me to log into HTC’s website and pick and choose RSS feeds, sources, and other things and tie that to my profile I would be much more content. For example, I would like to weigh some social media updates more heavily than a Yelp recommendation. Keep reaching for the stars, HTC, you’re getting closer each time out. As someone who loves to play with launchers, change icons and wallpapers, or install new widgets I love what HTC has done for the One M9. Specifically, I was so happy to see them embrace Themes. 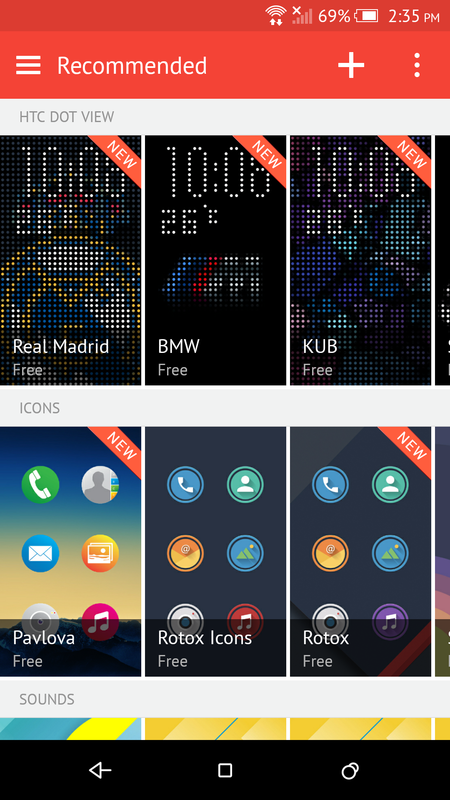 Users can pick a layout with like-minded icons, fonts, color schemes, sounds, and wallpapers. Indeed, this is a rabbit hole for me as I am constantly looking at the various themes being created by HTC and the community. 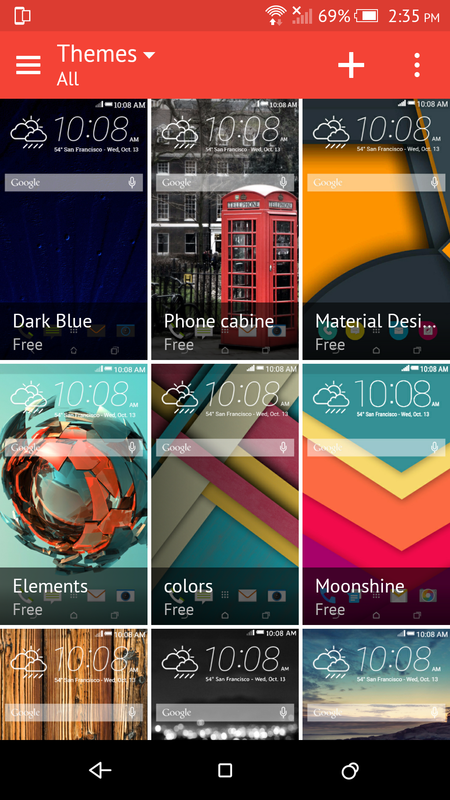 To that end, I certainly recommend heading to the HTC site for themes and having a look around. There’s so many to install already in these early days and it’s only to get better. If there was a drawback to the themes its that I might like 80 percent of the look but something about the widget or font irks me. Unfortunately you’re constrained on the handset and cannot do the full tailoring. But, head to the website and you’ll be able to customize the look to your liking. HTC does a great job of leaving Android alone for the most part. You don’t have to look hard for things such as pinning apps, notification filters, and other Lollipop features. What’s more, HTC even lets users decide which order they want to place the Home/Back/Recent Apps buttons across the bottom. If you’re coming from another hardware maker you’ll not be slowed by having things out of order. The default keyboard is good, but not perfect. For me, nothing beats the Google Keyboard that can be freely installed and customized to my liking. After using the Google option for more than a year or so I have become accustomed to its learning, key placements, and other tiny details. It’s not that the HTC version is terrible; it’s better than it has ever been. Auto-correction could certainly use a punch-up but otherwise this one does the job for most users. While the battle for pixels per inch has now gotten into Quad HD territory I was surprised to learn HTC opted for a 1080p (Super LCD) display for the One M9. At 5-inches it trails far behind the competition but ultimately matters not to the average end user. Looking closely at the screen you are very hard-pressed to discern any pixels; viewing angles are some of the best we’ve seen on smartphones. Going any larger and it might have made a difference but then you’re not dealing with something as pocketable or easy to use with one hand. Colors are great on the HTC One M9 and black looks very crisp. It’s not a perfect 100% black, but it sure does look good. Spend time playing games, looking at photos, or just generally playing with the phone and you’ll be thoroughly impressed by the screen. I did not have the chance to review the One M8 however my understanding is that this screen is “cooler” than the predecessor. What’s more, other reviews I’ve seen indicate it feels less vivid or punchy than the display in last year’s model. With that said, I am reminded of one simple principle. If you have nothing to compare this to you’ll have a hard time finding something “wrong” or lacking. The One M9 feels (and looks) almost equal parts One M7 and One M8. Suffice it to say, this is a good thing as we love holding this one in our hand. It’s angular where it needs to be yet doesn’t feel sharp or border on squarish. On the other hand, we like the smooth polished finish and tapered edges. Looking at the device straight away you see the BoomSound speakers across the top and bottom of the face. The front-facing UltraPixel selfie camera, for its part, sits to the upper right corner. The speaker grille holes are very tiny but really push the sounds through. Depending on the lighting you might not even “see” them at all. Not to worry, though, because you definitely hear them. The phone offers Dolby 5.1 surround sound effects which promise a cinematic experience. While it’s very easy to discern the left and right channels, it’s not all that easy to notice differences between Theater and Music modes. However, you won’t find anything else that delivers the levels and clarity that the One M9 does. The One M9 feels fantastic and has just the right amount of weight. While you might initially find it heavy, especially as compared to other models, that goes away quickly. Indeed, the gunmetal and polished hairline effect has an air of quality and the overall package exudes attention to detail. If there’s one word that comes to mind in this phone it’s sturdy. The nano-SIM and microSD card slots are tucked into the left and right edges, respectively. You can’t take the cover off and/or remove the battery; everything can be reached without digging under the hood. The volume rocker (right side) is split in half with the power button sitting below the two. Looking closely you see a spiral pattern printed into the power/wake button. This helps make it easily identifiable without looking. The One M9 is available in three color options: rose gold and silver, all-silver, and gunmetal. I’ve not spent any time with the other colors but I’ve seen them in person and find that all three are a nice touch that border on premium without pretense. Depending on what kind of person you are you may want to get a protective case; there are plenty of official offerings to choose from. The One M9 can feel a tad slippery in the right (or wrong) conditions and the finish is not something you’ll want to scuff. Along those lines, HTC’s Uh-Oh Protection plan is something you just don’t find in any other handset maker. Should you break the glass or crack the screen or even get water damage in the first year HTC will replace the phone for free. Hell, they’ll even extend the courtesy should you switch carriers in that same time frame. The best part of this is that it comes free of charge and is just a perk of buying the One series. You can’t really put a price on this but it’s something I am sure some of us would have been glad to have in years past. In an interesting twist, or about face, HTC has opted to go from UltraPixels back to megapixels in the M9. Yes, after spending so much effort on convincing us it in our interest to have UltraPixels, we’re given the standard unit of measurement (20-megapixels) in the 2015 flagship. Well, that is, of course, except for the front-facing camera which is still UltraPixels. The first few pictures I took with the One M9 were not what I would have liked but I would later learn it was the result of a software defect. HTC has since pushed an update and pictures are more accurate and much clearer. Also gone is the greenish vibe that was found in some images. As I mentioned above, I did not review the One M8 so I cannot do a true comparison. However, looking through the reviews of others I get the sense that there isn’t a case of one camera being better than the other. In other words, we might have expected more behind the push to return to megapixels. With that said, I found the camera to be very responsive even out of the box. I wager to guess that most users don’t dig deep when it comes to smartphone cameras. HTC, for its part, provides a really efficient setup for those who just want to snap pics in the moment. In terms of the software side of the camera I really enjoy using the HTC One M9. There are a number of settings and controls to play with, some to satisfy the most powerful of users. Should you be the type of shooter who tweaks the ISO and white balance or toggles exposure settings, you’ll have plenty of tools. On the other side of the coin there are some standard modes (Selfie, Panorama, etc) to choose from if you’re more of the “open and shoot” sort of user. Once you take your pics you can go in and remove red eye, add some particles, or create videos. Indeed, there are some fun settings to play around with and a few of them produce really cool creations. I don’t have any saved images from the front-facing camera but I can tell you it provides a much wider photo than other models. If you’re the selfie type of user (I am definitely not) then you will appreciate the picture quality and software for editing. Powered by a Qualcomm 810 processor and packing 3GB RAM, the One M9 screams along, handling everything you throw at it. Whether it’s an HD video, a massive first-person shooter game, or simply hopping from one app to another, this phone takes it all in stride. You’ll have to look elsewhere for a head-to-head matchup or for benchmark scores. Our typical reader doesn’t care all that much for those sort of things, but we do know there’s a market for it. And, having a peek around the internet, we found the One M9 performs admirably and stands toe-to-toe with others recent models. I like to keep my screen a touch more dim than my friends. I often set this on the first time I turn it on and never notice the difference. Keeping that in mind, I am consistently pulling in a full day’s work and play with this one. Even on days where I deliberately did not charge the phone I found myself going well into a second day before looking for a charger. I can image that playing with the power modes could push me two solid days. If you’re in the market for a highly-rated, well-constructed smartphone you’ll have a difficult finding more for your money than the HTC One M9. Priced competitively to begin with, the Uh Oh Protection gives it an obvious edge. I was thoroughly impressed with the software experience in this phone even though I didn’t love every aspect. While I do tend to prefer a more stock Android experience, I was not quick to hide or turn off the HTC stuff that comes out of the box. Those who are graduating from the first or second generation One models will feel right at home. Likewise, those who are getting into their first smartphone altogether will be pleased with the ease and setup of the One M9.